unable to sit on the ground or have trouble getting up. There is no need to miss out on the benefits of yoga just because you may have restrictions. Chair yoga offers people of all ages and abilities all of the benefits of traditional yoga in a chair. We begin by tuning into our breath to calm and focus the mind. Next, we warm up with gentle movements to loosen our shoulders, ankles, legs, feet and hands. Then we slowly transition into a flow of seated yoga postures while synchronizing these movements to our breath. Each class concludes with a restorative Savasana; a brief period of conscious rest to integrate the benefits of our session. This class will help to increase your strength, flexibility and energy and decrease stress. You’ll leave feeling balanced in body, mind and spirit. No prior experience is necessary. Class is 60 minutes. Limited to 14 students. Patti has been practicing yoga for most of her life. She was first introduced to yoga as a teenager growing up on the Jersey shore and has been hooked ever since. She became certified to teach yoga in 2017 so that she could share her passion for yoga with others. 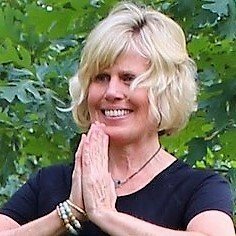 In addition to receiving her 200-hour teacher certification from Yogasphere, Patti has taken additional training in restorative and chair yoga, and is also a Reiki Master. Patti feels strongly that yoga is for everyone. Her goal is to help clients of all ages and abilities de-stress and feel balanced in body, mind and spirit through asana, pranayama and meditation.